Qantas has forecast an improved second half as it further screws down on costs and realises further gains from lower fuel prices after reporting its best first half result in five years. The airline group said net profit for the six months to December 31 2014 came in at $203 million, a big turnaround from a net loss of $235 million in the prior corresponding period. Chief executive Alan Joyce said the return to profitability was a result of the company’s three-year transformation program, which aims to take out $2 billion in costs by the end of the 2016/17 financial year. The program achieved $374 million in benefits in the first half of 2014/15, with comparable unit costs across the group falling 4.8 per cent. Qantas said in a slide presentation accompanying the first half results the transformation program was forecast to achieve $675 million in savings by the end of 2014/15. Some 4,000 of the 5,000 planned job cuts were expected to have been made by June 30 2015. All of Qantas’s operating segments were profitable in the first half, with Qantas International returning to the black for the first time since the global financial crisis and Qantas Domestic resuming its historic position as the earnings powerhouse of the group with underlying earnings before interest and tax (EBIT) of $227 million, a fourfold increase from the prior corresponding period. Its frequent flyer division continued to post strong earnings growth, while Qantas Freight had its best half year result in eight years as better loads on international routes lifted yields. The Jetstar group of airlines also reported better results – the low-cost carrier’s Australian domestic and international flying posted positive underlying EBIT while its Asian-based franchises had a “reduction in losses” for the half. Qantas said underlying profit before tax – which the airline regards as the best indicator of financial performance – was $367 million for the first half, compared with a $252 million loss in the prior corresponding half. It was the company’s best first half performance since 2010 and above its own estimates of a $300-350 million result. Revenue rose 2.1 per cent to $8.071 billion, Qantas said in a statement to the Australian Securities Exchange on Thursday. “Today’s results are good and we take pride in our progress so far,” Joyce said. Joyce said Qantas retained an “overwhelming 80 per cent revenue share” of the Australian corporate market, having renewed 113 large corporate accounts, won 42 new accounts and lost four. Slumping oil prices provided a $33 million gain in the first half and were expected to provide a “significant boost to the bottom line” in the current half. In terms of the outlook, Joyce said the operating environment for the second half had improved after turbulent period. The Qantas boss said demand was mixed in the domestic market and steady in the international market, noting that capacity had moderated in both segments and was now more closely aligned to demand. “We expect all operating segments to be profitable in the full year,” Joyce said. However, Qantas did not offer specific profit guidance for the the rest of 2014/15 citing the “high degree of volatility and uncertainty in global economic conditions, fuel prices and foreign exchange rates”. 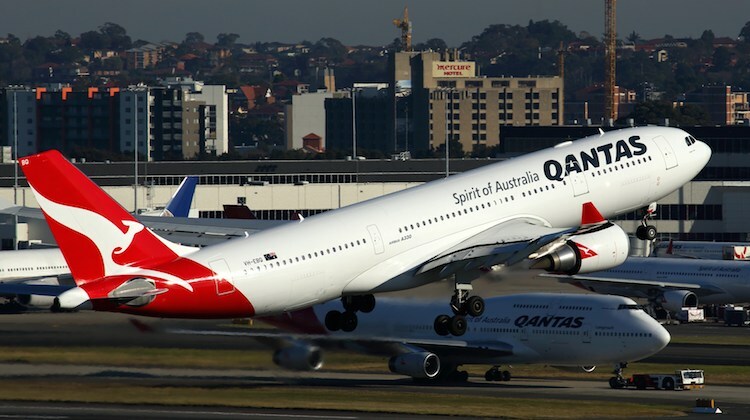 Qantas was also coy about its capacity plans for the rest of 2014/15, noting only that capacity across the airline group – Jetstar’s orange star and Qantas’s red tail – was expected to increase by 1.5-2 per cent in the second half compared with the prior corresponding period. “A large element of the capacity growth is coming from increased utilisation on international markets,” Joyce said, citing extra flights such as seasonal services to Los Angeles, Santiago and Vancouver. “In the domestic market the demand environment is mixed. We are not seeing levels of growth or expecting levels of growth in capacity on that market going forward. Qantas’s slide presentation said its group domestic capacity was forecast to remain moderate in line with market conditions, “maintaining flexibility to adjust as conditions require”. The airline group expected to retire up to eight aircraft in the current half – one Boeing 747-400, one Q300 turboprop, and “up to” six 737-800s – and pick up one 787-8. Well done to the QANTAS team (from bottom to top) for the profit turnaround, one that looks like it is sustainable and now provides the stable and strong foundation to continue the repositioning of the brand and hopefully a return to some markets. As I stated in comment to a previous article I am a big supporter of QANTAS and have been a QClub member for over 15 years however, like many WA residents this loyalty has become somewhat tested internationally when considering we cannot fly on a full service carrier direct to major priority destination such as Bali, Singapore and New Zealand, even through the OneWorld alliance, and we have to resort to alliance members for Dubai (London), Hong Kong, Kuala Lumpur and the like. It is quite disappointing that our flag carrier who continues to promote itself as the airline of choice for West Australians and provides the best options, clearly does not. With the new Virgin terminal opening soon, with the multitude of options available through its alliance with Singapore Airlines, Etihad and Air New Zealand and its now comprehensive schedule to the Eastern States and directs internationally, I would suggest QANTAS either gets greater RED ROO options out of Perth or suffer further degradation of its customer base. Jetstar is not a viable or comparable option. I’m sure if SIA can support 3 and 4 times daily flights plus have SCOOT run the route, I’m sure a daily QF A330 linking into the Jetstar Asia network on short haul would certainly be viable. Maybe if QANTAS stopped thinking Sydney centric and looked beyond the Blue Mountains it would appreciate that WA people want service as much as over East. I like many will be considering jumping airlines once the Virgin Terminal is complete with its new state of the art lounge and direct international transfers to either premium of budget options. Mmm wonder how long before the unions start their antics again as Qantas is back in the black……. Of course the unions would not consider the fact that the share holders are entitled to get a dividend for their long term support of Qantas. Interesting comment from PeterL who somehow believes that his probably $500 parcel of Qantas Shares makes him a more important stakeholder than an employee who may have 20 years invested in the success of Qantas. This adversarial belief has led QF down the path that it appears to be finally extracting itself from. How about engaging employees, rather than just considering them a cost to the business. If the workers are happy they will work to make the customers happy, and in turn make the company profitable, thus making the shareholders happy. Following on from RayB, how about the unions be a bit more reasonable and realistic with their demands. I’m not suggesting the staff should take little to nothing and I am not suggesting that management have been angels either, but the union noise has been ridiculous at best. If all and sundry took their blinkers off they would realise that staff cuts would likely have not been as drastic had the demands over the past few years not been as high and more attuned to the greater population. I wonder if those that lost their jobs sent Christmas cards to the unions thanking them for their support! Don’t like Joyce much at all, but have to concede that he’s now being vindicated (so far anyway). I’d love to know how much the “Qantas International” profit would have been in this half if the airline HADN’T written down the value of it’s aircraft in the previous half. A basic understanding of accounting leads me to suspect that essentially many years of future depreciation charges that would have affected many future years of reporting instead was taken in one large hit last year? Can anyone offer an insight? I think you will find that Qatar, Cathay and Malaysia all fly from Perth to those destinations you suggested. Last time I checked they are all members of the oneworld alliance. That being said I agree with you in regards to Qantas not flying from Perth. There is enough of a market there for Dubai and Singapore easily. The only question would be that Qantas does not have the appropriate aircraft to fly those routes. I don’t think an A380 to Dubai would be profitable and I would imagine that Emirates are influencing Qantas somewhat in international operations. I wonder if the 5 year deal with Emirates will be renewed? With Qatar in oneworld, Qantas could shift its operations through Doha to link into the Qatar networks? Makes sense to me, if Qantas is a firm believer in the global alliance. Well RayB I don’t have shares in anything….. Qantas has to compete in a global market and to do that they have to have a competitive cost base, the unions seem to have missed this point. Jason your 5:13 pm comment sums it up beautifully, well said. I go a long with Damian we are still in the realms of creative accountancy. Now that the Reserve Bank of Australia has finally woken up after 6 years, it has realised that the interest rate is out of line with other major economies, causing an over valuation of the $A. The $A will return to its true value making offshore maintenance less attractive and fuel dearer. For RayB. An employee is rewarded fortnightly with a pay packet. While how the employee performs their role is important, it has to be acknowledged that the airline exists because people purchase shares in the company. As for flying out of Perth. The advantage that the Asian and Middle Eastern carriers have is that that they operate a hub system in their home states. Which means that passengers they uplift out of Perth don’t all go to the same destination but are fed into the the passenger distribution that the hub supports. Qantas can’t compete with that as an end of line carrier. So using the frequency of flights of competitors out of Perth as an argument for Qantas is not realistic. I hope they can operate international out of Adelaide to Singapore again.It feeds into the BA onto London and Finnair to Helsinki and maybe reintroduce the Paris via Air France link.A lot of us have this fear of Flying Malaysia Airlines at the present time and going via Dubai is not even an option with Emirates.A well timed service for the South Australian Market leaving around 2 or 3pm dependent on time of year on the way over and a return around 10 or 11pm on the backward leg is all we South Australians ask for.Is that too much Qantas? I appreciate your point regards QATAR, Cathay and Malaysia and the OneWorld alliance however none of these operators satisfy Singapore of which is the most frequented and demanded full service international destination out of Perth, and is the most practical gateway to Asia. I also note your comments regards the EMIRATES deal and the OneWorld alliance with QATAR. Having served out of QATAR, Dubai is a far more preferable destination for transit and holidays and quite frankly I think any such move will jeopardise the recent progress in their International Business. Additionally, if the Mid East Carriers can sustain multi-daily flights between them (5 direct daily standard) at good load factors at or about 75-80%, surely QANTAS can manage a single daily PTH – Mideast – London regardless of their alliances, or at least re-instate PTH – Singapore – London, acknowledging that Singapore – London through loads may be an issue given the PTH – Singapore demand. Either way, in a couple of months Emirates are commencing their upgrade from B777 / A330 to A380 hence further increasing capacity providing further justification that demand for Red Roo International services to Europe from other capitals other than Sydney does exist. I would have thought a daily B787 PTH – Sin and daily PTH – Dubai – London would be a minimum with daily PTH – Hong Kong, , PTH – Osaka and PTH – J’burg to follow. At least QANTAS could then justify a B787 long haul base maintenance and crew base with the potential to expand to PTH – Auckland, PTH – KL and PTH – Bali to follow. Jetstar and OneWorld serve a purpose but the demand for Red Roo is well documented and well supported. Sorry for a late response, but where are the 6 738s going?